Hearty welcome to the PDM University , Bahadurgarh, Haryana. P. D. Memorial Religious & Educational Association which was founded in 1995-96 in the memory of Late. Shri Prabhu Dayal Ji, and which has been imparting world class quality education for the last more than 20 years to hundreds of thousands of students through its PDM Group of Institutions has now launched the PDM University with a modern and magnificent campus and excellent facilities. I really deem it an honor and a rare privilege to be the founder Vice-Chancellor of this University and assure you that this University shall soon become the flagship university of the country known for excellence of its teaching, research and innovation with a focus on all round development of the students. To make this University a world class university, no doubt, one needs time, money, infrastructure, good governance and management but above all, one needs to have the best talent in terms of faculty, students and staff. It will be our endeavor to ensure that the University is able to attract, retain and nurture the best minds and hence fulfill the dreams of our Chancellor and visionary Hon’ble Smt. Bimla Singh Prabhu ji. The two major activities of any University are to create and disseminate knowledge and our endeavor would be to excel in both of them. The creation of knowledge requires good research and innovation facilities while the dissemination of knowledge requires outstanding faculty and learner centric environment to create fertile minds. Our university is committed to provide students with the best of the faculties, facilities, learning environment, professional experience, practical training and placements in the career you have chosen to pursue with us. The focus of our teachers would be to encourage thinking, innovation and creativity amongst the students. I can say with full confidence that this university will provide the students with ample opportunities to express and present their creativity and talent. Please remember that at times University life can be challenging. Effective time management and personal discipline will be a major key to your success here. It will be vital to set some clear immediate as well as distant goals and then move ahead with bull dog determination and confidence to achieve these goals. As you are our key stake holders, we also seek your suggestions for the betterment of the University. We assure you that we are there by your side always and we will do our best to meet your aspirations. Once again I welcome all the students who have chosen to be a part of this University. I am sure that you will feel proud on being associated with us and make us equally proud with your academic and professional achievements. I wish you all the best in your future career as students of this University . Prof.Bakhshi has been recipient of several awards and academic honours. These include amongst others : World Education Award, Haryana Ratan Award, Bharat Jyoti Award, Fellowship of the IUPAC; Lifetime Achievement Award by IAEWP, Guest of Honour at the 26th IGNOU Convocation at Varanasi, Felicitation at the Centenary Celebration of Vigyan Parishad Prayag, Distinguished Teacher Award; National Education Award by Headlines Today News Channel; Bioved Honorary Fellowship, Chemical Research Society of India (CRSI) Medal; Fellowship of the National Academy of Sciences (FNASc); JSPS Fellowship; DAAD Fellowship; INSA Research Fellowship; UGC Career Award; Prof. P.K.Bose Memorial Award of the Indian Chemical Society, Best Paper Award in the field of Chemical Sciences from DAAD; Young Chemist Award; Dr. Krishan Rao Gold Medal, Dr. R. D. Desai Award of the Indian Chemical Society, Prof. R.P. Mitra Gold Medal, ISCA Best Poster Awards of the Indian Science Congress Association for the years 2012 and 2015. India Didactics Association (IDA) 2014 Special Award for excellence in Digital Content in Education for our template etc. Prof Bakhshi was awarded Capital Foundation National Award for distinctive and outstanding contribution to Education by former President of India Dr. APJ Abdul Kalam (December 2011). 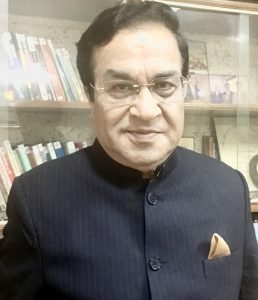 Prof. Bakhshi has also been elected as the President of the section of the Chemical Sciences of the Indian Science Congress Association (ISCA) for the year 2011-12. Prof. Bakhshi has been member of the editorial board of the Indian Journal of Chemistry (Section A). He has also been the member of the editorial board of the Journal of Scientific and Industrial Research published by the CSIR and also the Chief-Editor of the UGC-sponsored journal Chemistry Education Review. He was also co-guest editor of the special issue of the Indian Journal of Chemistry on Conducting Polymers. Prof. Bakhshi is recognised as one of the best teachers of Chemistry in the country. Prof. Bakhshi has delivered many Talks / Plenary Lectures / Keynote Addresses at various conferences and seminars both in India and abroad. He has also Chaired Technical Sessions at various national/international conferences. He has also been very actively involved in the organization of many conferences, workshops and seminars at the national / international level.